This list of article rewriter software will be useful if you are looking for a good article spinner software. Several of these are 100% free and you get trial versions for rest which need a one time payment or monthly/annually subscription. Don’t expect free tools to be 100 perfect and have everything you need. This tool has been around for while and has both free version and a paid version. Free version has basic spinning options but paid one which cost you around $127 one time fee has lots of other great features like grammar checker etc. You can download the free one and try your self or you can pay $7 for Pro version trial. It seems this site is no longer available. 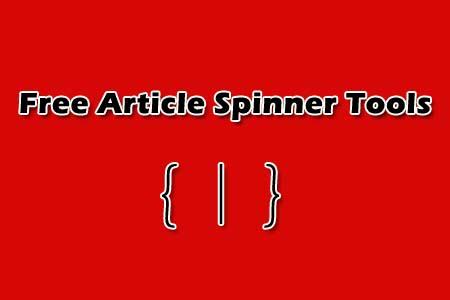 Instant Article Suite pro is free article spinner which is easy to use. It comes in a bundle which has a free spinner, free shuffler, free submitter and a collection of 2600 PLR articles. It’s a really nice tool for personal use if you want to spin content your self. X-Spinner also has paid and free version. You need to download it through Whitehatbox software manager. One cool thing about this spinner is you can use it with third-party software such as WPRobot, GSA, SERobot etc. It has lots of advance features which you can use in both versions. Also it can use other spinner APIs TBS, WordAI, and SpinRewriter APIs to make better content. I haven’t tried the content Professor spinner but seen it mentioned in several forums. It’s a online spinner and I don’t see anything about a desktop version. Paid version cost you $9.99/month if you pay quarterly. It has some nice features like Multilingual Thesauri which support English, Spanish, French, German etc. They give a 14 day free trail. Then $139 one time payment. Also this software has both API and desktop software.